The Kia Soul, which was introduced in 2009, has performed well enough in safety tests to earn a top score of five stars from EU government-supported, independent car-testing organization EuroNCAP and be named a Top Safety Pick by the U.S. Insurance Institute for Highway Safety. Numerous suppliers contribute to the vehicle's safety, including Continental AG and IEE SA. Continental produces the tire pressure monitoring system that alerts the driver to under inflation or punctures. Mobis supplies airbag modules and IEE SA the seatbelt reminder. Gentex Corp. provides, depending on vehicle trim level, a special rearview mirror that reduces the risk of backup accidents. The mirror incorporates a 3.5-inch (89mm) liquid crystal display (LCD) connected to a rear-facing camera. When reversing, the LCD becomes visible in the mirror, replacing a portion of the reflected image normally seen. Furthermore, the U.S. supplier's contribution reduces rear glare during night driving. Front- and rear-facing sensors determine if it is both dark and whether the vehicle is being excessively illuminated from behind. In such circumstances the mirror will automatically dim to reduce dazzling. The secret to the design is an electrochromic gel, sandwiched between two pieces of glass within the mirror, that changes color when an electric current is applied. Mando Corp. makes substantial contributions to driving safety by providing the antilock brakes and the electronic stability control. 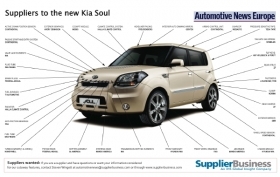 Kia assembles the Soul in Gwangju, South Korea. Prices in Germany start at 15,900 euros.